Many people in the world and America celebrate Hanukkah, but you might not realize it. There is so much emphasis on Christmas during the Months of November and December. Hanukkah often gets pushed to the side slightly. The good news here is that I am not pushing Hanukkah to the side. If you celebrate this awesome holiday, then you deserve to know there are some great nail art ideas out there for the holiday itself. If you don’t celebrate Hanukah, but you want to have your nails be a part of this holiday too that’s fine. The more we represent Hanukkah or Chanukah the more people will realize this is an important part to the season. Not just by religious culture, but by American culture. You see when Christmas presents and Santa were introduced Hanukkah also got a little bit of an upgrade with gifts too. So it’s important to remember we are all connected through art, culture, and love during this fabulous season. Proving this connection, I’m going to start out with some nail art by the glam lady Mr. Kate. That’s her name on YouTube and her blog at least. Mr. Kate is a woman who creates amazing DIY projects and it didn’t stop when it came to nail art. She has come up with an idea to connect all of us together this great holiday season. These nails aren’t solely Hanukkah nails, but I thought we would start out with this tutorial and then get into the traditional nail art for Hanukah. This manicure features Kwanza and Christmas along with Hanukkah. It doesn’t leave anyone out and that’s what the holidays are for after all. Bringing people together. Check out this nondenominational manicure art here. Katrinaosity is a YouTube user who knows exactly what nail art and holidays are all about. She has an amazing Hanukkah manicure that has been the envy of everyone who sees them. These nails are made with gold foils, but you don’t have to have acrylic nails to have this art. You can have this art with or without acrylics. This is a minimalistic look or elegant as I would say. It has beautiful gold stars of David, blue and golden nails alternating that will take your breath away. If you want some elegant Hanukkah nails, then this is the tutorial you need to see. This design is more complex, but if you’re into a traditional Hanukkah nail this will be your best bet. These nails represent the 8 days of Hanukkah. The candles lit and unlit are part of the nail art as well as the star of David. The colors on these nails mainly appear to be white, blue and gold, but there are more than a few polish colors to create this look. In the end, it’s all worth it. Check out the tutorial here. This is a 4D dreidel spinner acrylic nail art tutorial. It’s so cute. There are rhinestones or gems, blue nails, the star of David, and a dreidel at the tip that actually spins! Everyone knows that the Dreidel song is as much of a part of Hanukah as Jingle Bells is to Christmas. So it’s important that we represent that in this great look that will really make your Hanukkah spin! Check out the tutorial here. If you liked the 4D Dreidel look then you need to check out this 3D design. It doesn’t spin, but it will take your breath away. Check out the tutorial here. If you don’t have acrylic nails and you want a beautiful dreidel look then go with this tutorial. The artist in this tutorial carefully paints on a beautiful dreidel in the middle of her nails with a blue shimmery polish base. I personally think this is a great way to show your support for the holiday and you don’t need many materials for this dreidel. This glitter fall nail art is perfect for Hanukkah, but you can use it for many occasions. If you want something versatile, but you still want to represent Hanukkah check out this tutorial. These are quite possibly the ultimate nail art when it comes to Hanukkah nail art. It includes all the Hanukkah colors, glitter, the star of David, Hebrew writing, and a Menorah to boot! This is gorgeous and I would love to rock these nails this Hanukkah season. Go here for the tutorial. 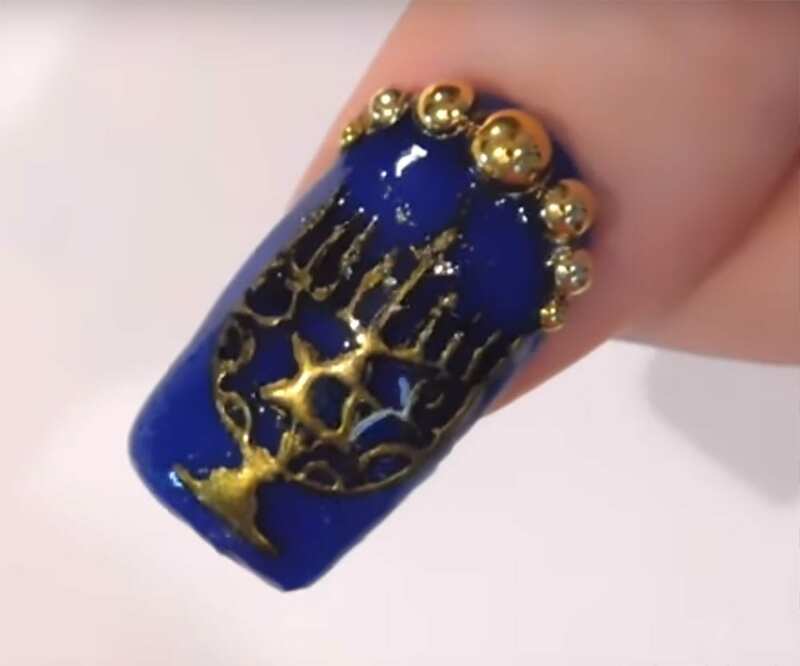 If you’re looking for more Menorah and you have acrylic nails, then this next design is for you. It features a gold embossed menorah. It literally looks like a real menorah became impregnated on your nails. It’s gorgeous! It’s elegant, simple and gorgeous! The dark blue overlay this artist uses is perfect for the season. There are even some 3D golden beads that match the gold embossed menorah. It’s definitely one for the books and the looks. Go here for the tutorial.